Let’s be clear: the strings are being pulled by a narrow group of special interests and don’t reflect the values that people in the West and across this country place on our shared heritage, our public lands. -- Michael Casaus, New Mexico state director. 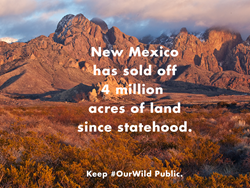 The state of New Mexico has sold 4 million acres of state trust lands to private interests and extractive industries, some of which endanger the health, environment, and economy of local communities, according to a report released this week by The Wilderness Society. These sell-offs account for nearly thirty-percent of the state’s original land holdings—a dangerous precedent behind recent efforts in Congress and the New Mexico state legislature to take over national public lands. The report, “New Mexico lands and outdoor opportunities lost to the highest bidder,” is a forewarning that public lands like national forests, monuments and parks could be sold, like state trust lands, to a narrow group of private interests for profit under state control. Once sold, public access is often blocked for outdoor activities like camping, hiking, hunting and fishing. In New Mexico, 12 pieces of legislation have been introduced since 2013 with the ultimate goal of confiscating national forests, refuges, parks and other shared lands that rightly belong to all Americans. While those who are trying to seize our public lands claim they have no intention of selling off these treasured assets, if history is any indicator, state-managed lands are often sold to ranchers, mining companies and oil and gas interests. $6.1 billion is spent on outdoor recreation in New Mexico. This spending supports 68,400 New Mexico jobs, generates $1.7 billion in wages, and produces $458 million in state and local tax revenue. Ninety percent of the state’s sportsmen hunt or fish on public lands, providing $579 million annually to the state’s economy. The report provides several examples of state land sales that benefited the pockets of private interests including extractive corporations like Molycorp Inc., Chino Copper Company, and Yates Petroleum Company, among others . These companies often leave behind environmental footprints. Molycorp Inc. purchased nearly 4,000 acres of state trust lands near Questa and the recently established Rio Grande del Norte National Monument. Some of this land was then used as a mine tailing facility and was declared a Superfund site by the EPA in 2011. The land is currently owned and operated by Chevron, and is in the process of a $143 million cleanup. Chino Copper Company initially purchased 7,181 acres of state trust land near Hurley, New Mexico in the early part of the 20th century. Some of these purchased state trust lands became a tailing site—a dumping ground for the mine’s waste. More recent owners, Phelps Dodge and Freeport-McMoRan Copper & Gold Inc., have had issues in the past protecting groundwater in the area. Yates Petroleum Inc. made a considerable purchase of 14,710 acres of state land near Artesia for oil exploration and drilling.